The newest addition to the DC Lounge catalogue. DC Design has unveiled the newest addition to the DC Lounge catalogue called the 'Lounge Ultimate'. The custom is based on the Toyota Innova Crysta. 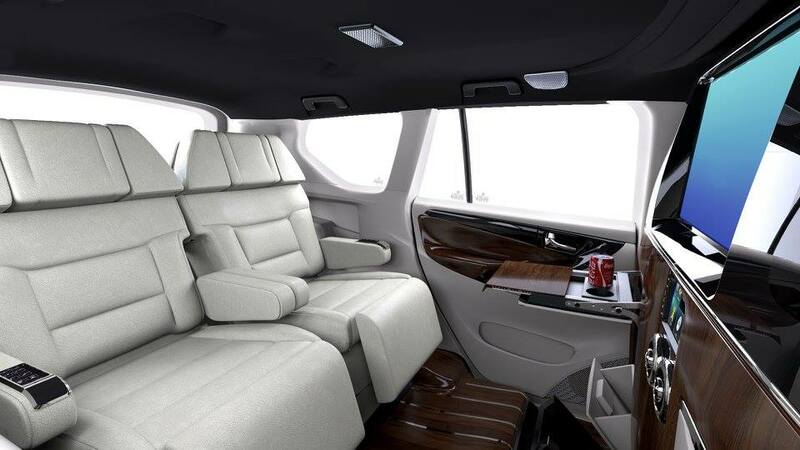 Although the prices have not been revealed, the Innova Crysta-based DC Lounge starts from INR 4.95 Lakhs (excluding the donor car). As in other Lounge kits offered for the Innova Crysta, DC have stripped the cabin seats, interior trim, and floors of the second and third rows, and added two, supple captain seats with power adjustments similar to what you'd find in the first class cabin of an aircraft, upholstered in premium white leather. The cabin comes adorned with wood, gloss black, chrome, aluminium embellishers, as well as wooden floorboards. It also has a touchscreen infotainment system hooked to a large TFT display mounted centrally for DVD playback, as well as a pair of HVAC vents, foldable tables and a mini refrigerator. Options available in other Lounge kits for Innova Crysta include fancy starlight roof liner and automatic window sunblind. The exterior can also be spruced up with a DC body kit comprising of more aggressive bumpers, sideboards, wheel arch cladding and the DC logo on the grille. The Innova Crysta can be had with one of three engine options: 2TR-FE 2.7L four-cylinder petrol with a 5-speed manual or 6-speed AT, 2GD-FTV 2.4L four-cylinder diesel with a 6-speed manual and 1GD-FTV 2.8L four-cylinder diesel with a 6-speed AT. Prices for the Innova Crysta range between INR 14.20 Lakhs - INR 21.4 Lakhs (ex-showroom Delhi).